Figure 1 : The ribosome assembles polymeric protein molecules whose sequence is controlled by the sequence of messenger RNA molecules. This is required by all living cells and associated viruses. The ribosome is a large and complex manif molecular machine, found within all living cells, that serves as the primary site of biological protein synthesis (translation). Ribosomes link amino acids together in the order specified by messenger RNA (mRNA) molecules. Ribosomes consist of two major components — the small ribosomal subunit which reads the RNA, and the large subunit which joins amino acids to form a polypeptide chain. Each subunit is composed of one or more ribosomal RNA (rRNA) molecules and a variety of proteins. The ribosomes and associated molecules are also known as the translational apparatus. The sequence of DNA encoding for a protein may be copied many times into RNA chains of a similar sequence. Ribosomes can bind to an RNA chain and use it as a template for determining the correct sequence of amino acids in a particular protein. 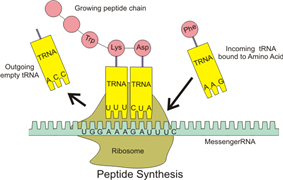 Amino acids are selected, collected and carried to the ribosome by transfer RNA (tRNA molecules), which enter one part of the ribosome and bind to the messenger RNA chain. The attached amino acids are then linked together by another part of the ribosome. Once the protein is produced, it can then 'fold' to produce a specific functional three-dimensional structure. A ribosome is made from complexes of RNAs and proteins and is therefore a ribonucleoprotein. Each ribosome is divided into two subunits: a smaller subunit which binds to the mRNA pattern, and a larger subunit which binds to the tRNA and the amino acids. When a ribosome finishes reading an mRNA molecule, these two subunits split apart. Ribosomes are ribozymes, because the catalytic peptidyl transferase activity that links amino acids together is performed by the ribosomal RNA. Ribosomes from bacteria, archaea and eukaryotes (the three domains of life on Earth) differ in their size, sequence, structure, and the ratio of protein to RNA. The differences in structure allow some antibiotics to kill bacteria by inhibiting their ribosomes, while leaving human ribosomes unaffected. In bacteria and archaea, more than one ribosome may move along a single mRNA chain at one time, each "reading" its sequence and producing a corresponding protein molecule. The ribosomes in the mitochondria of eukaryotic cells functionally resemble many features of those in bacteria, reflecting the likely evolutionary origin of mitochondria. Nobel Prize in Physiology or Medicine, in 1974, for the discovery of the ribosomes. The Nobel Prize in Chemistry 2009 was awarded to Venkatraman Ramakrishnan, Thomas A. Steitz and Ada E. Yonath for determining the detailed structure and mechanism of the ribosome. Figure 2 : Large (red) and small (blue) subunit fit together. The ribosome is responsible for the synthesis of proteins in cells and is found in all cellular organisms. It serves to convert the instructions found in messenger RNA (mRNA, which itself is made from instructions in DNA) into the chains of amino-acids that make up proteins. The ribosome is a cellular machine which is highly complex. It is made up of dozens of distinct proteins (the exact number varies a little bit between species) as well as a few specialized RNA molecules known as ribosomal RNA (rRNA). Note – these rRNAs do not carry instructions to make specific proteins like mRNAs. The ribosomal proteins and rRNAs are arranged into two distinct ribosomal pieces of different size, known generally as the large and small subunit of the ribosome. Ribosomes consist of two subunits that fit together (Figure 2) and work as one to translate the mRNA into a polypeptide chain during protein synthesis (Figure 1). Because they are formed from two subunits of non-equal size, they are slightly longer in the axis than in diameter. Prokaryotic ribosomes are around 20 nm (200 Å) in diameter and are composed of 65% rRNA and 35% ribosomal proteins. Eukaryotic ribosomes are between 25 and 30 nm (250–300 Å) in diameter with an rRNA to protein ratio that is close to 1. Bacterial ribosomes are composed of one or two rRNA strands. Eukaryotic ribosomes contain one or three very large rRNA molecules and multiple smaller protein molecules. Crystallographic work has shown that there are no ribosomal proteins close to the reaction site for polypeptide synthesis. This proves that the protein components of ribosomes do not directly participate in peptide bond formation catalysis, but rather suggests that these proteins act as a scaffold that may enhance the ability of rRNA to synthesize protein (See: Ribozyme). Figure 3 : Atomic structure of the 30S Subunit from Thermus thermophilus. Proteins are shown in blue and the single RNA chain in orange. The ribosomal subunits of prokaryotes and eukaryotes are quite similar. The unit of measurement is the Svedberg unit, a measure of the rate of sedimentation in centrifugation rather than size, and this accounts for why fragment names do not add up (70S is made of 50S and 30S). Prokaryotes have 70S ribosomes, each consisting of a small (30S) and a large (50S) subunit. Their small subunit has a 16S RNA subunit (consisting of 1540 nucleotides) bound to 21 proteins. The large subunit is composed of a 5S RNA subunit (120 nucleotides), a 23S RNA subunit (2900 nucleotides) and 31 proteins. Affinity label for the tRNA binding sites on the E. coli ribosome allowed the identification of A and P site proteins most likely associated with the peptidyltransferase activity; labelled proteins are L27, L14, L15, L16, L2; at least L27 is located at the donor site, as shown by E. Collatz and A.P. Czernilofsky. Additional research has demonstrated that the S1 and S21 proteins, in association with the 3'-end of 16S ribosomal RNA, are involved in the initiation of translation. Eukaryotes have 80S ribosomes, each consisting of a small (40S) and large (60S) subunit. Their 40S subunit has an 18S RNA (1900 nucleotides) and 33 proteins. The large subunit is composed of a 5S RNA (120 nucleotides), 28S RNA (4700 nucleotides), a 5.8S RNA (160 nucleotides) subunits and 46 proteins. During 1977, Czernilofsky published research that used affinity labeling to identify tRNA-binding sites on rat liver ribosomes. Several proteins, including L32/33, L36, L21, L23, L28/29 and L13 were implicated as being at or near the peptidyl transferase center. The ribosomes found in bacteria (see Endosymbiotic theory) and as such their ribosomes are similar to those of bacteria. The various ribosomes share a core structure, which is quite similar despite the large differences in size. Much of the RNA is highly organized into various tertiary structural motifs, for example pseudoknots that exhibit coaxial stacking. The extra RNA in the larger ribosomes is in several long continuous insertions, such that they form loops out of the core structure without disrupting or changing it. All of the catalytic activity of the ribosome is carried out by the RNA; the proteins reside on the surface and seem to stabilize the structure. This article incorporates public domain material from the NCBI document "Science Primer". ^ Benne R, Sloof P (1987). "Evolution of the mitochondrial protein synthetic machinery". BioSystems 21 (1): 51–68. ^ PALADE GE (January 1955). "A small particulate component of the cytoplasm". J Biophys Biochem Cytol 1 (1): 59–68. ^ Roberts, R. B., editor. (1958) "Introduction" in Microsomal Particles and Protein Synthesis. New York: Pergamon Press, Inc.
^ "The Nobel Prize in Physiology or Medicine 1974". Nobelprize.org. The Nobel Foundation. Retrieved 10 December 2012. ^ a b Wimberly BT, Brodersen DE, Clemons WM Jr, Morgan-Warren RJ, Carter AP, Vonrhein C, Hartsch T, Ramakrishnan V (September 2000). "Structure of the 30S ribosomal subunit". Nature 407 (6802): 327–39. ^ Czernilofsky, A; Küchler, E; Stöffler, G.; Czernilofsky, P. (1976). "SITE OF REACTION ON RIBOSOMAL-PROTEIN L27 WITH AN AFFINITY LABEL DERIVATIVE OF TRANSFER-RNA-F(MET)". FEBS Letters (ELSEVIER SCIENCE BV) 63 (2): 283–286. ^ Czernilofsky, A; Collatz, E; Stöffler, G; Küchler, E (1974). "PROTEINS AT TRANSFER-RNA BINDING-SITES OF ESCHERICHIA-COLI RIBOSOMES". Proceedings of the National Academy of Sciences of the United States of America (NATL ACAD SCIENCES) 71 (1): 230–234. ^ Czernilofsky, A; Kurland, C.G. ; Stöffler, G. (1975). "30S RIBOSOMAL-PROTEINS ASSOCIATED WITH 3'-TERMINUS OF 16S RNA". Febs Letters (ELSEVIER SCIENCE BV) 58 (1): 281–284. ^ a b c Ben-Shem A, Garreau de Loubresse N, Melnikov S, Jenner L, Yusupova G, Yusupov M. (February 2011). "The structure of the eukaryotic ribosome at 3.0 Å resolution". Science 334 (6062): 1524–1529. ^ a b Rabl, Leibundgut, Ataide, Haag, Ban (February 2010). "Crystal Structure of the Eukaryotic 40S Ribosomal Subunit in Complex with Initiation Factor 1". Science 331 (6018): 730–736. ^ a b Klinge, Voigts-Hoffmann, Leibundgut, Arpagaus, Ban (November 2011). "Crystal Structure of the Eukaryotic 60S Ribosomal Subunit in Complex with Initiation Factor 6". Science 334 (6058): 941–948. ^ Czernilofsky, A; Collatz, Ekkehard; Gressner, Axel M.; Wool, Ira G.; Küchler, Ernst (1977). "IDENTIFICATION OF TRNA-BINDING SITES ON RAT-LIVER RIBOSOMES BY AFFINITY LABELING". Molecular and General Genetics (Springer Verlag) 153 (3): 231–235. ^ Recht MI, Douthwaite S, Puglisi JD (1999). "Basis for bacterial specificity of action of aminoglycoside antibiotics". EMBO J 18 (11): 3133–8. ^ O'Brien, T.W., The General Occurrence of 55S Ribosomes in Mammalian Liver Mitochondria. J. Biol. Chem., 245:3409 (1971). ^ Yusupov MM, Yusupova GZ, Baucom A,et al. (May 2001). "Crystal structure of the ribosome at 5.5 A resolution". Science 292 (5518): 883–96. ^ Schuwirth BS, Borovinskaya MA, Hau CW, et al. (November 2005). "Structures of the bacterial ribosome at 3.5 A resolution". Science 310 (5749): 827–34. ^ Mitra K, Schaffitzel C, Shaikh T, et al. (November 2005). "Structure of the E. coli protein-conducting channel bound to a translating ribosome". Nature 438 (7066): 318–24. ^ Selmer M, Dunham CM, Murphy FV,et al. (September 2006). "Structure of the 70S ribosome complexed with mRNA and tRNA". Science 313 (5795): 1935–42. ^ Korostelev A, Trakhanov S, Laurberg M, Noller HF (September 2006). "Crystal structure of a 70S ribosome-tRNA complex reveals functional interactions and rearrangements". Cell 126 (6): 1065–77. ^ Yusupova G, Jenner L, Rees B, Moras D, Yusupov M (November 2006). "Structural basis for messenger RNA movement on the ribosome". Nature 444 (7117): 391–4. ^ Savir, Y; Tlusty, T (Apr 11, 2013). "The ribosome as an optimal decoder: a lesson in molecular recognition.". Cell 153 (2): 471–9. ^ Rodnina MV, Beringer M, Wintermeyer W (2007). "How ribosomes make peptide bonds". Trends Biochem. Sci. 32 (1): 20–6. ^ Cech T (2000). "Structural biology. The ribosome is a ribozyme". Science 289 (5481): 878–9. In bacterial cells, ribosomes are synthesized in the cytoplasm through the transcription of multiple ribosome gene operons. In eukaryotes, the process takes place both in the cell cytoplasm and in the nucleolus, which is a region within the cell nucleus. The assembly process involves the coordinated function of over 200 proteins in the synthesis and processing of the four rRNAs, as well as assembly of those rRNAs with the ribosomal proteins. When a ribosome begins to synthesize proteins that are needed in some organelles, the ribosome making this protein can become "membrane-bound". In eukaryotic cells this happens in a region of the endoplasmic reticulum (ER) called the "rough ER". The newly produced polypeptide chains are inserted directly into the ER by the ribosome undertaking vectorial synthesis and are then transported to their destinations, through the secretory pathway. Bound ribosomes usually produce proteins that are used within the plasma membrane or are expelled from the cell via exocytosis. Free ribosomes can move about anywhere in the glutathione and is, therefore, a reducing environment, proteins containing disulfide bonds, which are formed from oxidized cysteine residues, cannot be produced within it. Free and membrane-bound ribosomes differ only in their spatial distribution; they are identical in structure. Whether the ribosome exists in a free or membrane-bound state depends on the presence of an ER-targeting signal sequence on the protein being synthesized, so an individual ribosome might be membrane-bound when it is making one protein, but free in the cytosol when it makes another protein. Figure 6 : A ribosome translating a protein that is secreted into the endoplasmic reticulum. Ribosomes are classified as being either "free" or "membrane-bound". In Figure 5, both ribosomal subunits (small and large) assemble at the start codon (towards the 5' end of the RNA). The ribosome uses RNA that matches the current codon (triplet) on the mRNA to append an amino acid to the polypeptide chain. This is done for each triplet on the RNA, while the ribosome moves towards the 3' end of the mRNA. Usually in bacterial cells, several ribosomes are working parallel on a single RNA, forming what is called a polyribosome or polysome. Figure 5 : Translation of mRNA (1) by a ribosome (2)(shown as small and large subunits) into a polypeptide chain (3). The ribosome begins at the start codon of RNA (AUG) and ends at the stop codon (UAG). Although catalysis of the peptide bond involves the C2 hydroxyl of RNA's P-site adenosine in a protein shuttle mechanism, other steps in protein synthesis (such as translocation) are caused by changes in protein conformations. Since their catalytic core is made of RNA, ribosomes are classified as "ribozymes," and it is thought that they might be remnants of the RNA world. Ribosomes are the workhorses of protein biosynthesis, the process of translating mRNA into protein. The mRNA comprises a series of codons that dictate to the ribosome the sequence of the amino acids needed to make the protein. Using the mRNA as a template, the ribosome traverses each codon (3 nucleotides) of the mRNA, pairing it with the appropriate amino acid provided by an aminoacyl-tRNA. aminoacyl-tRNA contains a complementary anticodon on one end and the appropriate amino acid on the other. For fast and accurate recognition of the appropriate tRNA, the ribosome utilizes large conformational changes (conformational proofreading) . The small ribosomal subunit, typically bound to an aminoacyl-tRNA containing the amino acid methionine, binds to an AUG codon on the mRNA and recruits the large ribosomal subunit. The ribosome contains three RNA binding sites, designated A, P and E. The A site binds an aminoacyl- RNA; the P site binds a peptidyl-tRNA (a tRNA bound to the peptide being synthesized); and the E site binds a free tRNA before it exits the ribosome. Protein synthesis begins at a start codon AUG near the 5' end of the mRNA. mRNA binds to the P site of the ribosome first. The ribosome is able to identify the start codon by use of the Shine-Dalgarno sequence of the mRNA in prokaryotes and Kozak box in eukaryotes. In 2011, the first complete atomic structure of the eukaryotic 80S ribosome from the yeast Saccharomyces cerevisiae was obtained by crystallography. The model reveals the architecture of eukaryote-specific elements and their interaction with the universally conserved core. At the same time, the complete model of a eukaryotic 40S ribosomal structure in Tetrahymena thermophila was published and described the structure of the 40S subunit as well as much about the 40S subunit's interaction with eIF1 during translation initiation. Similarly, the eukaryotic 60S subunit structure was also determined from Tetrahymena thermophila in complex with eIF6. The first atomic structures of the ribosome complexed with tRNA and mRNA molecules were solved by using X-ray crystallography by two groups independently, at 2.8 Å and at 3.7 Å. These structures allow one to see the details of interactions of the Thermus thermophilus ribosome with mRNA and with tRNAs bound at classical ribosomal sites. Interactions of the ribosome with long mRNAs containing Shine-Dalgarno sequences were visualized soon after that at 4.5- to 5.5-Å resolution. Two papers were published in November 2005 with structures of the Escherichia coli 70S ribosome. The structures of a vacant ribosome were determined at 3.5-Å resolution using x-ray crystallography. Then, two weeks later, a structure based on cryo-electron microscopy was published, which depicts the ribosome at 11–15Å resolution in the act of passing a newly synthesized protein strand into the protein-conducting channel. The first papers giving the structure of the ribosome at atomic resolution were published almost simultaneously in late 2000. The 50S (large prokaryotic) subunit was determined from the archaeon Haloarcula marismortui and the bacterium Deinococcus radiodurans, and the structure of the 30S subunit was determined from Thermus thermophilus. These structural studies were awarded the Nobel Prize in Chemistry in 2009. Early the next year (May 2001) these coordinates were used to reconstruct the entire T. thermophilus 70S particle at 5.5 Å resolution. The general molecular structure of the ribosome has been known since the early 1970s. In the early 2000s the structure has been achieved at high resolutions, on the order of a few Å. Figure 4 : Atomic structure of the 50S Subunit from Haloarcula marismortui. Proteins are shown in blue and the two RNA chains in orange and yellow. The small patch of green in the center of the subunit is the active site. It should be noted that the production of the component parts of the ribosome from a messenger RNA molecule is rather strongly isomorphic with the self-replication model of von Neumann.